The U.S. Golf Association last week unveiled its Open For All fan experience tied to next month’s U.S. Open, featuring a longer calendar and a larger, national footprint for activation compared with past years. Some of the programming will now run for more than a month leading up to the June 18-21 event at Chambers Bay Golf Course in University Place, Wash. That compares with last year, when theprogram was tied more specifically to the tournament itself at Pinehurst, N.C. — though it did continue for the following week as well, when the U.S. Women’s Open came to Pinehurst. Thetournaments are in separate locations again this year after last year’s unique pairing. Also unlike like last year’s event, this year’s Open For All experience will not be held near the course. 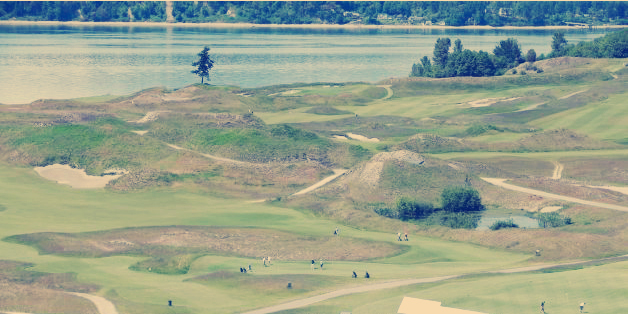 Instead, the bulk of the event will take place in Seattle, some 30 miles north of Chambers Bay. The USGA is using Momentum again this year to help develop the fan experience programming. This is the third year of the fan event. New to the program this year is a national U.S. Open Trophy Tour that began last week in New York City and will stop at various cities across the country, concluding at Chambers Bay on June 14.The tour is sponsored by Lexus and will be promoted by Fox, which for the first time will broadcast the U.S. Open this year. Among the stops on the tour will be various Fox affiliates and MLB ballparks across thecountry. Last year, the USGA held its trophy tour only in the Carolinas. Another new element to the program this year is the five-week Epic Putt Challenge, to be located at the Seattle-Tacoma International Airport beginning this week and continuing through June 15. After that time, the putting green for this particular activation will be relocated to South Lake Union Park near downtown Seattle as part of the general fan experience that will run June 17-21. “What is new is stretching the calendar and being in the community a little further in advance,” said Sarah Hirshland, senior managing director of business affairs for the USGA, which stages the U.S. Open. Other scheduled events include the USGA-sponsored Learning Science Through Golf education exhibit at Seattle’s Pacific Science Center, starting this week and continuing through June 15. Similar to last year, the Open For All event in Seattle will feature an LED board showing live action and highlights from the tournament, a merchandise tent with U.S. Open gear, and food and beverage sold by regional vendors. USGA officials wanted to broaden the event’s reach by putting it in a more urban area. Like last year at Pinehurst, the USGA will hold its presentation of the Bob Jones Award during U.S. Open week. The USGA’s highest award this year will be given to Barbara Nicklaus, wife of golf legend Jack Nicklaus, who will receive the award June 16 during a ceremony at the Museum of Glass in downtown Tacoma, Wash.